Only twenty-six US stamps were issued between 1945 and 1947, an average of about eight issues a year. These commemorative and special issues reflected a tremendous range of nationally important subjects. The most important of these commemorative US stamps were the memorial set issued, following the untimely death of President Franklin D. Roosevelt, and a series of six pictorial stamps commemorating the contributions of the United States Armed Forces during World War II. There were also five statehood anniversaries during this period, which were celebrated with the issue of commemorative US stamps. The 3 C. denomination stamp shown above, at the left (Sc. #927), was issued on March 3, 1945 to celebrate the 100th Anniversary of Florida Statehood. The design features the Florida State Seal, the Gates of St. Augustine, and the State Capitol at Tallahassee. The 5 C. denomination stamp shown above, at the right (Sc. #928), was issued on April 25, 1945 to celebrate the United Nations Conference on International Organization, held in San Francisco, California. The United Nations Charter was signed on April 26, 1945 by the representatives of fifty countries. The United Nations officially came into existence on October 24, 1945, when the new Charter was ratified by China, France, the Soviet Union, the United Kingdom, and the United States. President Franklin D. Roosevelt had been ill for many years, and his health declined rapidly during the war years. On the afternoon of April 12, 1945, he had what is believed to have been a cerebral hemorrhage, losing consciousness, and he died later that day. Franklin Roosevelt, having been the president in the years following the Great Depression and during World War II, was very highly esteemed by the American people, and his death brought widespread public sorrow, both in America and around the World. He will forever hold the record as the only President of the United States to have been elected to four consecutive terms in office! The four US stamps shown above (Sc. 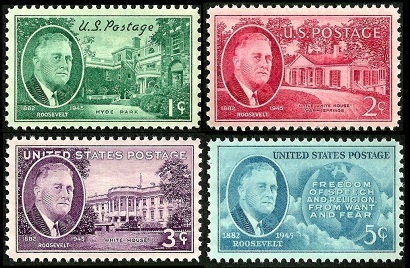 #930-33) were issued between July 1945 and January 1946 in memory of President Franklin D. Roosevelt. 01 C. - President Roosevelt and his Hyde Park home. 02 C. - President Roosevelt and his Warm Springs, Georgia home. 03 C. - President Roosevelt and the White House. 05 C. - President Roosevelt, map of the Western Hemisphere, and the Four Freedoms. The 3 C. denomination stamp shown above, at the left (Sc. #937), was issued on November 26, 1945 in memory of Alfred E. Smith, the former Governor of New York. Alfred E. Smith (1873-1944) was an American statesman, who was elected to four terms as the Governor of New York. He was also the Democratic Party candidate for president in 1928. The 3 C. denomination stamp shown above, at the right (Sc. #938), was issued on December 29, 1945 to celebrate the 100th Anniversary of Texas Statehood. The design features flags of the United States and the State of Texas. The 3 C. denomination stamp shown above, at the left (Sc. #941), was issued on June 1, 1946 to celebrate the 150th Anniversary of Tennessee Statehood. The design features the State Capitol in Nashville, a portrait of Andrew Jackson (1767-1845), one of the founders of the State of Tennessee, and a portrait of John Sevier (1745-1815), the first Governor of the State of Tennessee. The 3 C. denomination stamp shown above, at the right (Sc. #942), was issued on August 3, 1946 to celebrate the 100th Anniversary of Iowa Statehood. The design features the Iowa state flag over an outline of the State of Iowa. The 3 C. denomination stamp shown above, at the left (Sc. #943), was issued on August 10, 1946 to commemorate the 100th Anniversary of the Establishment of the Smithsonian Institution in Washington, D.C. The Smithsonian Institution was established in 1846 for the "increase and diffusion of knowledge". It is a group of nineteen museums and nine research centers, administered by the U.S. government. It is the largest such complex in the World, drawing over thirty million visitors per year. The 3 C. denomination stamp shown above, at the right (Sc. #944), was issued on October 16, 1946 to commemorate the 100th Anniversary of the Kearny Expedition. The design features the painting, Capture of Santa Fe, by Kenneth M. Chapman (1875-1968), an Indiana-born artist and anthropologist, who spent much of his life studying and painting American Indian life in New Mexico. The Kearny Expedition was a military campaign of the Mexican American War (1846-1848) led by Major General Stephen W. Kearny (1794-1848). His forces captured Santa Fe on August 15, 1846, claiming the new Territory for the United States, and he became the New Mexico Territory's first Military Governor. His military campaign went on to capture Alta California in 1847, and his army eventually succeeded in capturing Veracruz and Mexico City, ending the war. He later died of yellow fever, which he had contracted during his campaigns in Mexico. The 3 C. denomination stamp shown above, at the left (Sc. #946), was issued on April 10, 1947 to celebrate the 100th Anniversary of the Birth of Joseph Pulitzer. Joseph Pulitzer (1847-1911) was a Hungarian-born, American newspaper publisher of the St. Louis Post Dispatch and the New York World. He was also a leader in the Democratic Party, and he was elected as a congressman from New York. He was a crusader against big business and corruption, and his journalistic efforts helped pave the way for mass-circulation newspapers that depended on advertising revenue and appealed to readers with multiple forms of news and entertainment. His estate established the Columbia University School of Journalism in 1912 and the Pultizer Prize in 1917. The Pulitzer Prize is given annually to reward outstanding achievements in journalism, literature, poetry, music, and drama. The 3 C. denomination stamp shown above, at the right (Sc. #947), was issued on May 17, 1947 to celebrate the 100th Anniversary of the First US Stamps. The design features portraits of George Washington, the first President of the United States, and Benjamin Franklin, the first Postmaster General of the United States, as well as early and modern methods of mail transportation. 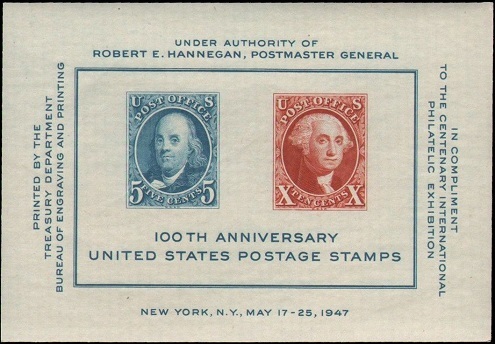 The portraits of Benjamin Franklin and George Washington were used for the first definitive US stamps. The imperforate souvenir sheet shown above (Sc. #948) was issued on May 19, 1947 for the Centenary International Philatelic Exhibition, held in New York City from May 17 through May 25, 1947. This souvenir sheet features imperforate reproductions, in changed colors, of the first two definitive US stamps, issued on July 1, 1847. The 3 C. denomination stamp shown above, at the left (Sc. #949), was issued on June 9, 1947 to honor the Physicians of America. The design features the 1891 painting, The Doctor, by the English painter, Sir Luke Fildes (1843-1927). The 3 C. denomination stamp shown above, at the right (Sc. #950), was issued on July 24, 1947 to celebrate the 100th Anniversary of the Settlement of the Utah Territory. The design features pioneers entering the valley of Great Salt Lake. The 3 C. denomination stamp shown above, at the left (Sc. #951), was issued on October 21, 1947 to celebrate the 150th Anniversary of the Launching of the U.S.S. Constitution. The design features a contemporary naval architect's drawing of the U.S.S. Constitution. The U.S.S. Constitution, also known as the the U.S. Frigate Constitution and as Old Ironsides, is a Frigate of the United States Navy, named by President George Washington for the United States Constitution. 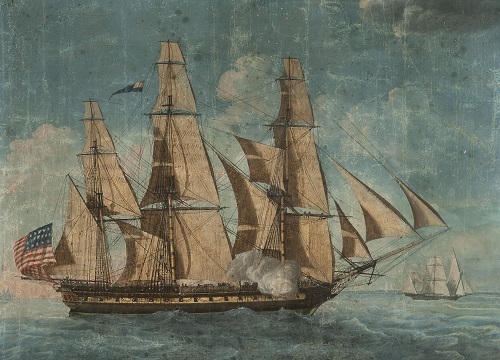 The frigate, first launched in 1797, is still a commissioned vessel of the United States Navy, and as such, it is the oldest commissioned naval vessel afloat. The Constitution was primarily employed as a naval warship, in combating the Barbary Pirates and during the War of 1812. The 3 C. denomination stamp shown above, at the right (Sc. #952), was issued on December 5, 1947 to celebrate the Dedication of the Everglades National Park in Southern Florida. The design features a Great White Heron and a map of Florida. The 3 C. denomination stamp shown above (Sc. #929) was issued on July 11, 1945 to honor the victory of the United States Marines in the Battle of Iwo Jima. The design is based on the World famous photograph showing the five Marines and a Navy corpsman raising the American flag on Mt. Suribachi, Iwo Jima. Though the U.S. Marine Corps forces won the battle, the casualties were enormous, especially considering the little island only had an area of about eight square miles. The U.S. casualties were 6,821 killed and 19,217 wounded. The Japanese casualties were 18,844 killed, 216 taken prisoner, and about 3,000 that presumably went into hiding. The 3 C. denomination stamp shown above (Sc. #934) was issued on September 28, 1945 to honor the contributions of the United States Army and the United States Army Air Corps during World War II. The design shows U.S. Army troops passing the Arch of Triumph in Paris, France, with U.S. Bombers flying in formation above. The 3 C. denomination stamp shown above (Sc. #935) was issued on October 27, 1945 to honor the contributions of the United States Navy during World War II. The design features a group of United States sailors. The 3 C. denomination stamp shown above (Sc. #936) was issued on November 10, 1945 to honor the contributions of the United States Coast Guard during World War II. The design features a Coast Guard amphibious landing craft and a supply ship. The 3 C. denomination stamp shown above (Sc. #939) was issued on February 26, 1946 to honor the contributions of the United States Merchant Marine during World War II. The design features a liberty ship uploading cargo. The Merchant Marine had a huge role in World War II, in transporting food, supplies, weapons, and millions of U.S. soldiers to various theaters of combat around the World. The 3 C. denomination stamp shown above (Sc. #940) was issued on May 9, 1946 to honor ALL the Veterans of World War II. The stamp features the Honorable Discharge Emblem, which was usually worn as a lapel pin by American veterans of World War II. The 3 C. denomination (Famous Americans type of 1940) stamp shown above (Sc. #945) was issued on February 11, 1947 to honor Thomas Alva Edison, an American inventor and businessman. Thomas Alva Edison (1847-1931) was the inventor of the phonograph, the motion picture camera, and the electric light bulb.